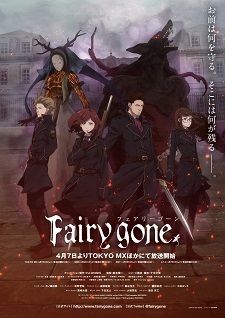 The official website for the previously announced Fairy Gone original TV anime has revealed more cast members. The ending theme song will be "Ash-like Snow" by (K)NoW_NAME. The anime will be airing on Mondays at 12:00 a.m. via Tokyo MX, BS11, AT-X, followed by MBS starting April 8. AnimeJapan 2019 stage for the anime will be held on March 24. Kana Ichinose (Mariya Noel), Tomoaki Maeno (Free Anderbar), Ayaka Fukuhara (Veronica Thorne), Yoshimasa Hosoya (Wolfram Row), and (K)NoW_NAME (Theme Song Performer) will appear for a talk show. Thank goodness it's not a Netflix exclusive. It looks like something out of Shin Megami Tensei. Man those creatures they summon sure do look unpleasing being full CGI. What a waste seriously, I thought the designs were really cool. Yeah, I’ve been waiting for a long time when this studio combines their good animation and experience in creating romantic shows. The character designs are bland as hell. It’s a pity that the other beings are full CGI but I’m still looking forward to this! Pretty good cast as a whole, too. I’m so excited for this anime. The synopsis sounds interesting animation is absolutely beautiful ... Eveything about this sounds PROMISING!!!! Really looking forward to this but I'm trying not to get my hopes up too high. First two eps. will be pre-screened via an event on April 6. Web radio via Onsen starts April 5.